Eggplant Parmesan: delicious stuffed, baked, and topped with panko! 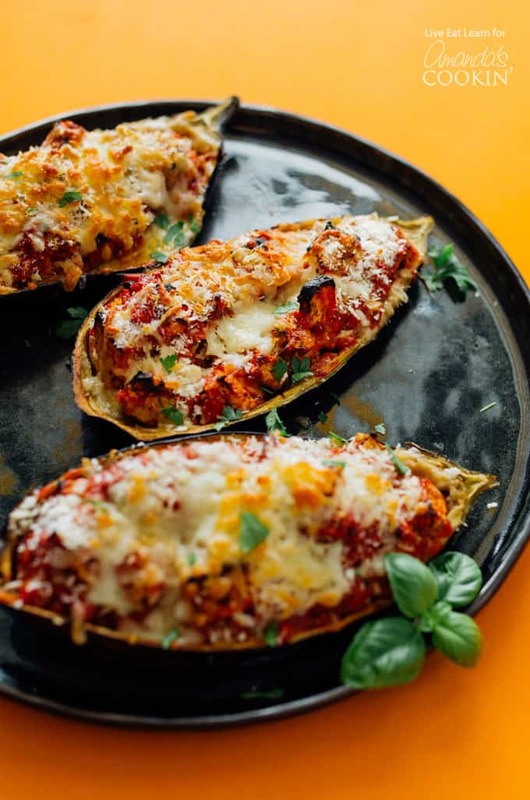 This fun take on Eggplant Parmesan takes all the deliciousness of this classic recipe (just like Chicken Parmesan) and stuffs it into the eggplant skin, making it a fun recipe that’s low on clean up! Eggplant parmesan was always my go-to ~fancy dinner~ in college. As a budding vegetarian with an inability to cook much of anything, I stuck to the vegetarian basics (i.e. frozen veggie burgers, pesto pasta, and eggplant parm). But I could never get it quite right. Compared to the gold standard eggplant parmesan (which to me, was Olive Garden), mine was just not crispy or cheesy or tender enough. But I recently thought of a way to transform my usual eggplant parmesan into something seriously delicious. Stuff it! 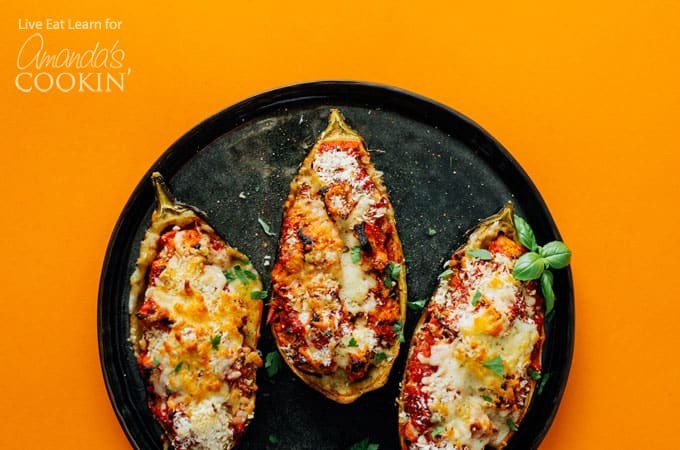 Making this Stuffed Baked Eggplant Parmesan is super simple. You’ll just score the eggplant and scoop out the insides. 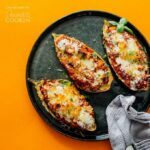 Throw them into a pot with some tomatoes and seasonings to let the flavors get to know each other, then stuff into hollowed eggplant skins. Bake until bubbly and aromatic, top with more cheese and some panko (for the perfect amount of crisp), and continue baking until golden brown and decadent. Serve to friends, family, and yourself! Love eggplant recipes? Try our Roasted Eggplant with Herbed Mint Sauce as your next side dish (or meal!) Or this delicious Baba Ganoush Hummus for the perfect veggie dip! 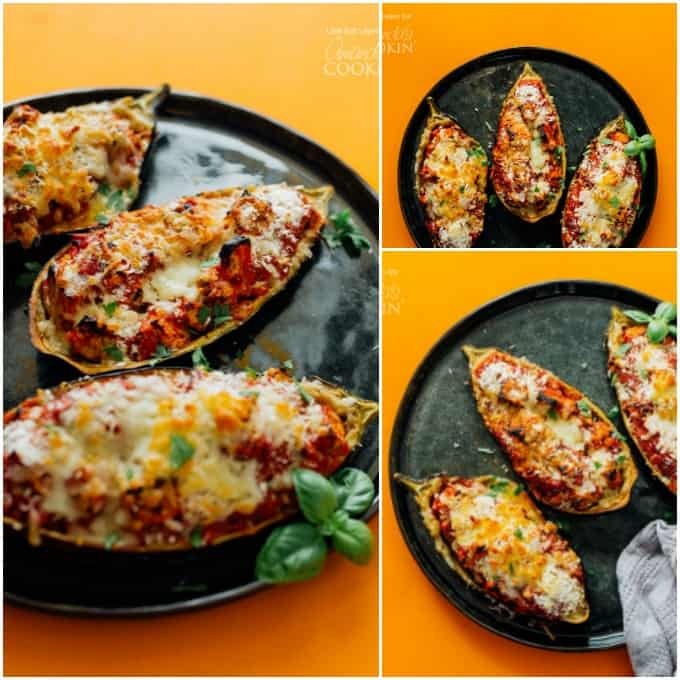 This fun take on Eggplant Parmesan takes all the deliciousness of this classic recipe and stuffs it into the eggplant skin, making it a fun recipe that’s low on clean up! Preheat oven to 400 degrees F. Set a medium saucepan over medium heat. Add the diced tomatoes, tomato paste, garlic, herbs, and salt. Stir to combine and bring to a gentle simmer. Meanwhile, cut each eggplant in half, lengthwise. Using a paring knife, score slits into the eggplant vertically and horizontally, being careful not to cut through the skin. Also make shallow cuts just inside the skin around the whole eggplant to help loosen it. Use a spoon (a grapefruit spoon if you have it) to gently scoop out the flesh. Throw eggplant cubes in with the tomatoes, as well as half of the mozzarella cheese. Stir to combine. Spoon eggplant tomato mixture into the hollowed out eggplants. Set on a baking sheet and bake for 25 minutes, or until eggplant is tender. After 20 minutes, sprinkle remaining mozzarella, parmesan, and panko on top and continue cooking 5 more minutes until cheese begins to brown.